This 6th bi-annual cooking and pairing competition showcasing sherry wines is on Tuesday 9 June. Jose Lopez-Montenegro – sommelier of Atrio restaurant in Caceres. Every two years, the world’s finest chefs and sommeliers come together in Jerez de la Frontera to compete in a unique international gastronomic competition, where dishes are paired with different sherry wines: Copa Jerez. Each pair of chef and sommelier, representing the restaurant where they work together, has already achieved top place in the national culinary pairing contest in one of the eight countries, which took place in 2014. This sixth Copa Jerez takes place this Tuesday, 9 June. The winner of the last competition, the fifth Copa Jerez in 2013, was Clou in Denmark. The nations represented in this year’s Copa Jerez are: Germany, Belgium, Denmark, Spain, the US, the Netherlands, the UK, and, for the first time, Russia. The Copa Jerez is not only a chance to showcase sherry wines and their perfect match with many types of food, but is also a powerful draw for restaurateurs and gourmet food and wine experts from around the world – around 500 are expected to attend . Each team of chef and sommelier has to produce three dishes, paired with three Sherry wines. 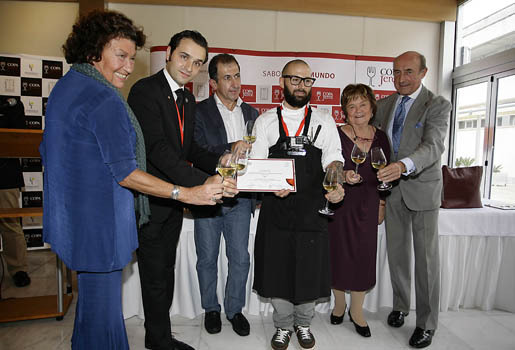 Celebrating winning the national final of Copa Jerez: the chef and sommelier (wearing red neckbands) of Atrio restaurant, with judges – Beltra Domecq, far right, is also judging the international final.